Choosing: Since heat rapidly converts the sugar in corn to starch, it is very important to choose corn that is displayed in a cool place. If shopping for corn in the supermarket, make sure it is refrigerated. If purchasing corn at a farmer's market or roadside stand, make sure that if the corn is not refrigerated, it has at least been kept in the shade, out of direct sunlight. Look for corn whose husks are fresh and green and not dried out. Buying: To enjoy corn's maximum flavor, purchase it on the day you are going to cook it since corn has a tendency to lose its flavor relatively rapidly. Store corn in a plastic bag in the refrigerator. Do not remove its husk since this will protect its flavor. To enjoy its optimal sweetness, corn should be eaten as soon as possible. Procuring: Corn grows in "ears," each of which is covered in rows of kernels that are then protected by the silk-like threads called "corn silk" and encased in a husk. Corn is known scientifically as Zea mays. 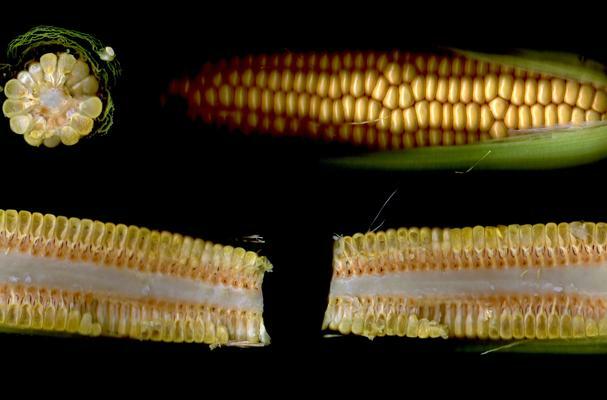 Corn can be cooked either with or without its husk in a variety of different ways. If using the wet heat methods of boiling or steaming, make sure not to add salt or overcook as the corn will tend to become hard and lose its flavor. Or, they can be broiled in the husk. If broiling, first soak the corn in the husk ahead. Cleaning: To completely clean corn for boiling or roasting, remove husks by pulling green leaves downward from the top tassle, be sure to remove the silky strings. To roast corn with the husks on, whether on a barbeque, open flame or in the oven (not recommended as it may smoke) - pull down the green leaves nearly to the bottom w/o removing completely from the stem and remove the silks from between the kernals and the green leaves. Once the silks are removed, you may add any number of ingredients - cheese (cojita and lime are a nice combination) and/or simply salt and pepper. Corn has played and still continues to play a vital role in Native American cultures. It has been greatly honored for its ability to provide not only sustenance as food but shelter, fuel, decoration and more. Because of the vital role that corn played in the livelihood of many native cultures, it has been one of the important icons represented in the mythological traditions of the Mayan, Aztec and Incan civilizations. History: An important food plant that is native to America, corn is thought to have originated in either Mexico or Central America. It has been a staple food in native civilizations since primitive times with some of the earliest traces of meal made from corn dating back about 7,000 years. Corn on the cob is incredible. Nice information as for me. Thnx a lot for enlightning this info.